One of the most convenient ways to travel between cities in Korea is by train. Bus schedules can vary depending on traffic, but that is hardly the case for the railroad, allowing passengers to make accurate travel plans and move to destinations on time. Korean trains are classified based on their speed and the amenities offered onboard. The classifications include the express trains KTX and KTX-Sancheon; regular trains ITX-Saemaeul and Mugunghwa; and KORAIL tourist trains. Ticket fares depend on the train type and distance of travel. The two main railway lines are Gyeongbu Line and Honam Line but other railway lines also include Jeolla and Gyeongjeon Lines, which reach as far as Yeosu and Changwon on the southern coast. For an affordable vacation traveling around Korea, tourists can consider buying the KORAIL Pass, a railway pass exclusively for foreigners that allows unlimited use of all trains, including the KTX, for a selected number of days. One of the most important railway stations in Seoul, Seoul Station is the starting point of the Gyeongbu Line, a double-track line that connects Seoul to Busan. Major stations on the Gyeongbu Line include Daejeon, Dongdaegu, Singyeongju, and Busan Station. Many other rail lines also start from Seoul Station, including the Jeolla∙Honam Line, with stops in Jeonju, Gwangju, Mokpo, and Yeosu. Yongsan Station is the start of the Honam Line, a double-track line that runs from Seoul to Mokpo. Major stations on the Jeolla∙Honam Line are Nonsan, Gwangju-Songjeong, Mokpo, and Iksan Stations. Travelers can also access the Gyeongbu Line from Yongsan Station. Cheongnyangni Station is for trains headed to the eastern provinces for tourist sites such as Jeongdongjin and Jeongseon in Gangwon-do, Andong and Gyeongju in Gyeongsangbuk-do, and the ITX-Cheongchun train for Chuncheon. A KTX express train route from Seoul to Gangneung opened on December 22, 2017. Yeongdeungpo Station covers the travel needs of passengers in the southwest part of Seoul. All non-express trains passing through Yeongdeungpo Station make stops here. Operating from Gangnam to various major cities in the nation, the SRT (Super Rapid Train) was introduced in December 2016. Presently, the SRT offers train services from Suseo Station in Seoul to Busan and Mokpo Stations. All trains on the Honam Line and Gyeongjeon Line departing from Yongsan Station and Mokpo Station make stops here, including the KTX. The station opened in 2015, reducing the travel time between Gwangju-Songjeong Station and Yongsan Station to only an hour and 33 minutes. An intercity bus station located nearby expands the options to other regions through bus transit. Busan Station first opened under the name Choryang Station in 1905. The station went under renovation and expansion in 2004, taking its present form. Busan Station is the first and last train station for all trains running on Gyeongbu Line and a major distribution hub of Northeast Asia. The completion of Dongdaegu Transit Center, or the Dondaegu Terminal, in 2016 connected Dongdaegu Station with the bus terminal, subways, and a shopping mall, making access to any of the four services easier than ever. Trains running on Gyeongbu Express Line, Gyeongbu Line, and Daegu Line make stops at this train station, with trains stopping by up to 400 times a day. Daejeon Station is located in Dong-gu, Daejeon. Currently, an estimated average of 40,000 passengers uses the station to travel on Gyeongbu Line and Chungbuk Line. Daejeon Station is famous for garak guksu (Korean noodles), and is located near a subway station of the same name on Daejeon Subway Line 1. Seodaejeon Station is the departure point for those who need to travel on the Honam Line from Daejeon Station. Seodaejeon Station was opened in 1936 at Seodaejeon Naegeori Intersection, Daejeon’s major traffic hub that divides the city into four cardinal directions. Ulsan Station is located in a suburban region of Ulsan-gun. Five buses, from Bus No. 5001-5005, operate from Ulsan Station to downtown cities of Ulsan and Yangsan with an interval of 25 to 30 minutes. Gangneung Station is located in Gyo-dong, Gangenung. With the Gangneung Line KTX in operation since December 2017, travel time between Seoul and Gangwon-do’s Gangneung now only takes two hours. Namwon Station is on Jeolla Line, bypassing the famous Jirisan Mountain. With a yearly average of 74,000 passengers, not only is Namwon Station frequented by the residents of Korea’s southern province, but it is also visited nonstop by tourists. Mokpo Station is the first and last train station on Honam Line as well as the southernmost train station in Korea. Since the station’s first commencement of KTX in 2004, it continues to see a huge number of both domestic and international travelers visiting nearby tourist attractions such as Dadohae Sea, Yeongam-gun, Haenam-gun, Muan-gun, Sinan-gun, and Jindo-gun. In addition to KTX, Mugunghwa and ITX-Saemaeul also make stops here. Inspired by Korea’s traditional architecture and Bulguksa Temple, Singyeongju Station features images of royal tombs and roof-end tile with face engraving as part of its landscape. Providing service to an estimated daily average of 3,200 passengers, Singyeongju Station was built in 2010 as part of government’s plan to further extend express train services throughout Korea. Suncheon Station is the major transportation hub connecting Jeollanam-do’s eastern regions, namely Yeocheon, Gwangyang, and Yulchon Industrial Complex. Many passengers stop by this station to transfer from Gyeongjeon Line to Jeolla Line or vice versa. Visitors can take the KTX and Mugunghwa Train at this station. Yeosu Station first opened in 1930 as the last stop on Joalla Line. KTX began to operate between Yongsan and Yeosu in 2011 upon the completion of Jeolla Line upgrade project. Other trains that stop by Yeosu EXPO Station are ITX-Saemaeul, Mugunghwa, and Nuriro. Originally named as Iri Station, the name was changed to Iskan Station in 1995. The construction of Honam Express Line reduced the travel time between Seoul and Iksan Station to one hour and 16 minutes on KTX. Other trains that stop by this Station are Saemaeul, and Mugunghwa. Jeonju Station is on Jeolla Line and built in a hanok motif. It takes approximately 1 hour and 35 minutes between Seoul and Jeonju Station on KTX. Besides KTX, ITX-Saemaeul and Mugunghwa also make stops at this station. Chuncheon Station is the stop after Namchuncheon Station and the last stop on Gyeongchun Line. Gyeongchun multi-track metro line was completed in 2010 and transit is provided by the newly introduced ITX-Cheongchun Train. Due to several popular attractions located nearby, Chuncheon Station is always bustling with visitors. Pohang Station is located in the northern region of Heunghae-eup. 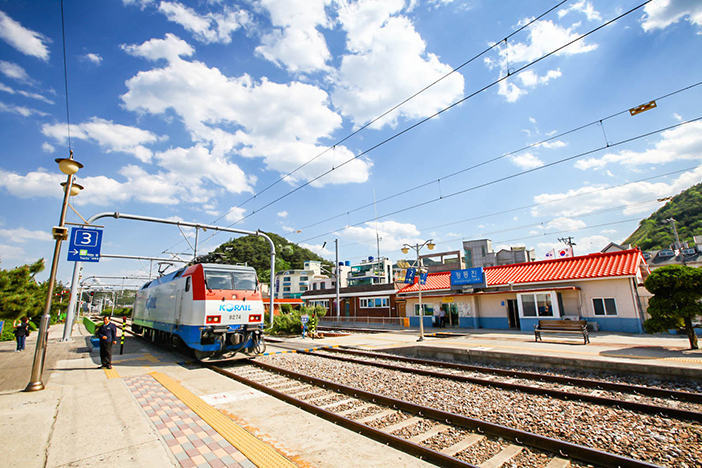 Since KTX started to provide service at Pohang Station in 2015, transportation between Seoul and Pohang, as well as other southeast coastal regions, has become much more convenient. Korea’s express train, aptly named the KTX, began operations in April 2004. This high-speed train has been designed to reach speeds of up to approx. 305 km per hour. Operating on Gyeongbu, Honam and Gyeongjeon Lines, this train runs in place of regular Saemaeul trains, running at a slightly faster speed. Mugunghwa has been in operation since the 1960s, making it the oldest passenger train in Korea. This train is the most common train type in Korea, making stops at smaller stations that the KTX or ITX-Saemaeul trains bypass. A super rapid train, known as the SRT, operates on the Gyeongbu and Honam Lines from Suseo Station. This page was last updated on February 11, 2019, and therefore information may differ from what is presented here.